Kosuke Ichikawa, Untitled, 2009, paper, incense, 37 x 60". Nothing in “Murmur,” Kosuke Ichikawa’s first solo exhibition at this gallery, can be taken for granted. The images, which look like high-contrast photographs when reproduced, are not only done by hand but are created through pigmenting and burning sheets of washi paper with incense sticks—a decidedly involved technique that intensifies the significance of the artist’s touch. The content is similarly illusory: Ostensibly generic depictions of woods turn out to be the imprints of Ichikawa’s memories, spontaneous flashbacks allegorically burned into his subconscious, then literally onto the paper. Even his process—Ichikawa begins from the upper right corner, descending toward the lower left, “scanning” the surface—is an affront to the conventional in-depth reconstructions of multiplanar landscapes. This is the second generation of Ichikawa’s incense pictures. Earlier incarnations were interesting enough but lacked the spatial complexity he reaches in the current show. The artist uses about sixty varieties of incense here, all with their own footprint—some sepia toned, some charcoal black. Still, there is nothing decorative or narrative in his works, despite the fact that many of them represent the image of trees. Close up, their lacelike patterns dissolve into abstract arrangements, proving just how dispensable drawing may be in representational work. 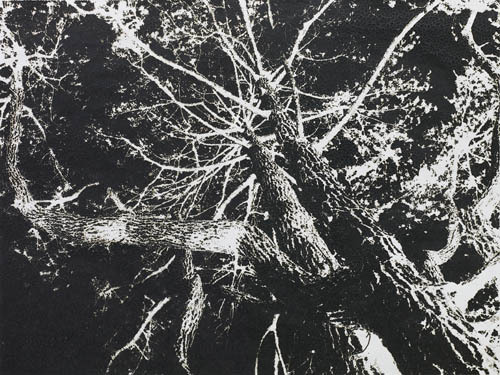 Not surprisingly, it is the most representational, lifelike works where the clash between the subject matter (the woods) and their incinerated fragments is most apparent. This clash, of course, is inherent in Ichikawa’s larger approach: In order to create the contrasts of light and dark, he carves away from the surface, reducing instead of adding. With that, the metaphor of the flashlight cutting through the darkness of nocturnal forest comes full circle—its beam transforms into the warmth of an incense stick, re-creating the image that has been glowing in the artist’s mind: some new kind of mental rayograph.